I'm no expert, but with the exception of the heroic graphic arts of the 1920s Leninist Soviet Union, I can think of few other artifacts that so vividly convey—propaganda or no—the brilliant optimism and energy of that unique time and place than Man With a Movie Camera. This delightful "Experiment in the Cinematic Communication of Visible Events" (and I can also think of few better or more pithy manifestoes on film than that deceptively simple "Communication of Visible Events") is an exuberant, timeless, and deeply felt and imagined classic film for one and all. Fortunately, the Russian film impresario Dziga Vertov's impossibly fresh meditation on life, freedom, beauty, work, and cinema has been enjoying another (always well deserved) resurgence of interest in recent years, appearing in the top 10 of the most recent Sight & Sound poll results and moving from #97 on the big list at They Shoot Pictures, Don't They? all the way up to #25. 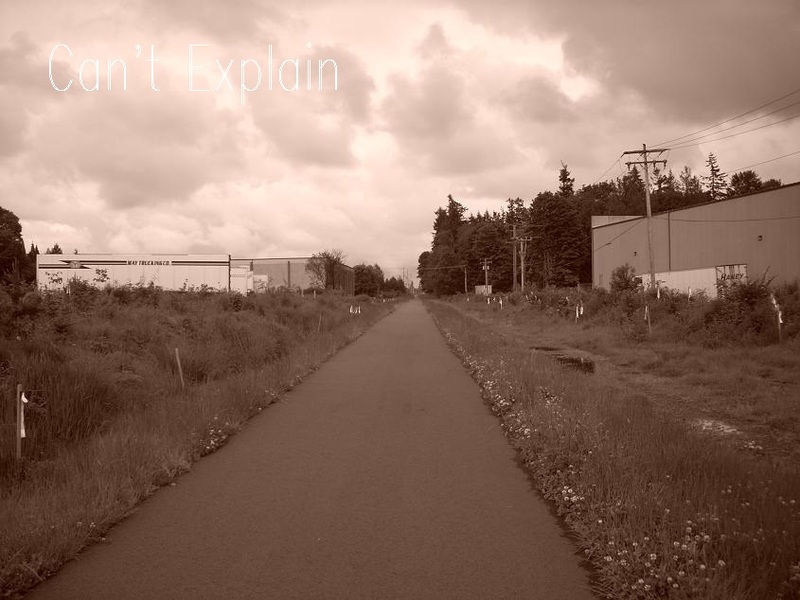 It's not hard to see why. For one thing, the formal designations as "avant-garde," "experimental," and sometimes "documentary" are a bit misleading and do not begin to convey how perfectly charming and visually adroit the picture is. It is a feast of the optical, with as many stunningly beautiful naturalistic scenes as forays into fantasy, and a willingness to try anything, including freeze frames, stop-motion animation, and other special effects. Man With a Movie Camera seems different every time I see it, and I have been looking at it periodically for decades. I constantly notice new things and often react to much of it as if I'd never seen it before. This is possibly due to its determined lack of narrative, which offers few of the usual hooks on which to focus one's impressions, or possibly to the different soundtracks. Or perhaps, somehow, it really is a different movie every time. Dwight Yoakam has never yet quite somehow connected with me. Or had not anyway, until this steamy little cooker was called to my attention. Everything about him has always seemed slightly overdone to me. The big hat is just the most visible symptom. There is also the Hollywood career and the piercing operatics of his voice, neither of which, I suspect, would everyone be inclined to consider weaknesses on his part. The album is Dwight's Used Records, a covers project and general sopping-up exercise, gathering tracks from all manner of origins, tribute albums, one-off duets, stuff from the vault, etc. (More reason for misgivings about Yoakam are the projects that seem slightly gimmicky: dwightyoakamacoustic.net was the album before this I had tried.) But "Mercury Blues"—a standard written in 1949, with which Alan Jackson had the most success, in 1992—is done just right, everything about it, starting with choosing it to record. Others who've taken a crack include Steve Miller, David Lindley, and Meat Loaf (in 2003). 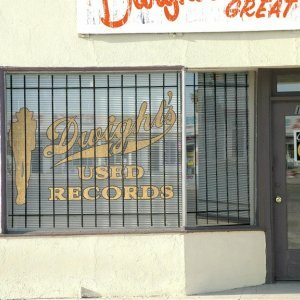 I don't know the rest of Dwight's Used Records that well, except that it's presently kind of hard to find. But the more I sit here playing "Mercury Blues," the more I think I should maybe look into it. This song has got such a sharp, smoldering quality to it—the quasi-Hammond organ fills have a lot to do with that, working an uptempo boogie groove, but the whole band is excellent and Yoakam has never sounded better to me, welling in and up and around this mess, hitting all the right notes hard, and then stepping back to let the electric guitar player hit a few. Is that him? 'Cos that crazy sound is the most, man. It's slick, tight, and I wanna hear it again. In my mind I have a slight confusion between Edward Eager, the author of this and several other children's books about magic, and Edward Everett Horton, a character actor of the '30s who went on to narrate the Fractured Fairy Tales series in Jay Ward's Rocky and Bullwinkle cartoons. "Edward," I suppose, and all those Es. But there's also something in both of the kindly twinkly-eyed older man somehow privy to or at least aware of children's fantasy lives, and never disapproving. I know I am surely dating myself with reference to all these objects of affection from mid-20th century, but there you go. I won't say Edward Eager was the J.K. Rowling of approximately my generation—he never approached her ability to produce great slabs of tome, my single favorite aspect of the Harry Potter franchise—but he was dealing with kids and with magic all the same. 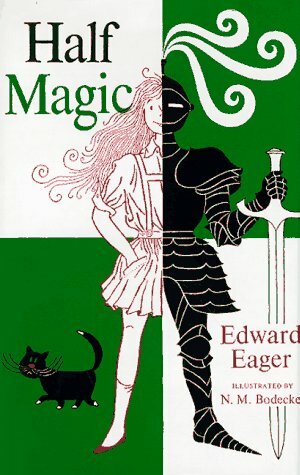 Half Magic, the first of his so-called Magic series (I don't remember it having a name back in the day, but maybe that's me) is not surprisingly tentative, the product I understand of Eager's own frustration that there were no children's books he wanted to read to his his son Fritz, besides those of E. Nesbit. (As an aside, books by Nesbit were not available in the children's libraries where I obtained the Eager books, and thus I assumed they were just further fabrication.) With Half Magic, Eager started to write them himself. The basic premise here is simple and ingenious—a mysterious found coin grants our heroes, a group of children who also appear in Eager's next book, Magic by the Lake, exactly one-half of each wish, though they can't predict how it will be divided in half, let alone which half they will get. But they try anyway to outthink it by doubling their wishes, with the kinds of results you can (or cannot) imagine. Eager was a native of Ohio born in 1911, a Harvard graduate, and a playwright and lyricist of some distinction as well the author of children's books. Not surprisingly the language in Half Magic is a perfect pleasure to read, simple and straightforward, out of the pellucid school of mid-century New Yorker. 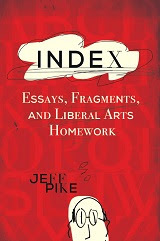 And everybody likes these books—certainly I do, still, very much—though I worry they may also seem antiquated. This would be the point where I heave a big self-satisfied sigh. "Oh, for the good old days again. Kids, get off my lawn with your fool smartphones," etc. But that doesn't mean it's not a good book. People will tell you that the early albums by Jefferson Airplane are good, better than you would expect. As it happens, I am one of those people. And here is one of those songs. There are a surprising number of good ones, not just the hits, on Surrealistic Pillow, After Bathing at Baxter's, and Crown of Creation (with the mushroom cloud on the cover), which is the home for this plaintive meditation, so deliberately constructed. By most standards Crown of Creation is a reasonably conventional LP: 11 songs, most in the range of two to four minutes. 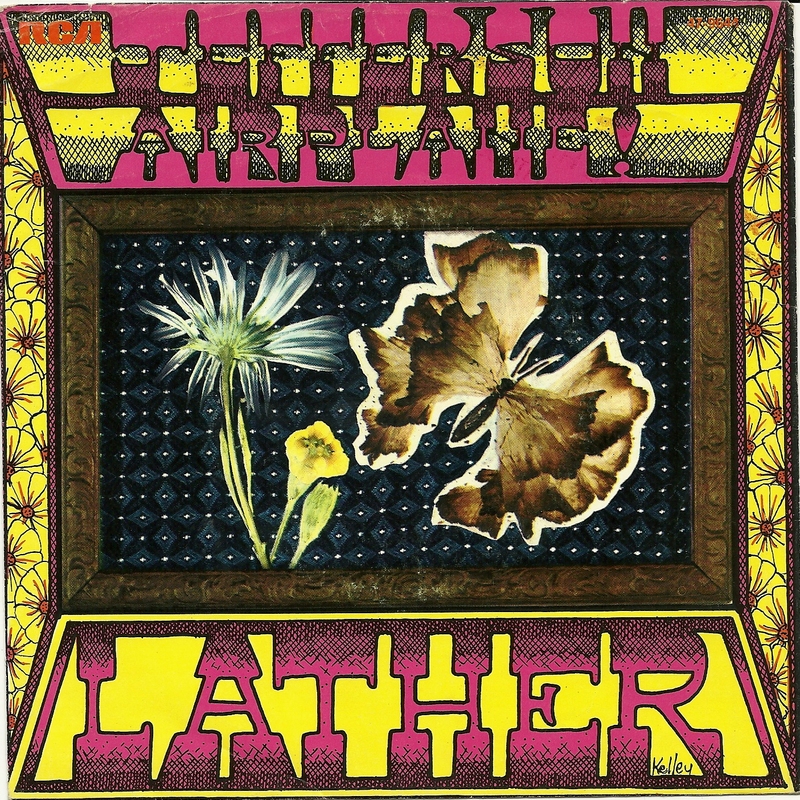 Grace Slick wrote two of them, including "Lather," Paul Kantner and Marty Balin collaborated on two others, and the rest are by others or other combinations of others (Balin has his name on four, Kantner on three). So a tremendous amount of diverse creative energy applies. 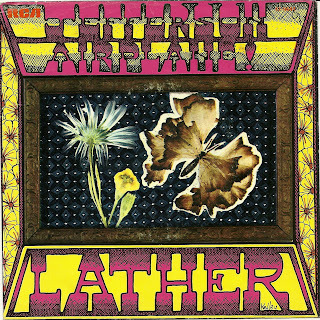 As for "Lather," among other things it's an interesting choice for the album kickoff, with fully absorbed '60s politics and values and loudly espousing them (basically, "don't trust anyone over 30" multiplied by "don't ever grow up" multiplied by reality). If this was supposed to be "acid rock," as touted, it didn't sound like anything I expected: mournful mostly, and slow, though full of tricks like typewriter keys and random vocal eruptions for texture, operating on parallel levels. The result is a weird ballad that is nonetheless affecting—not the story, which is a bit trite, but the focus brought to bear in making the music realize the story. In its outrageous way it is understated, and vice versa, and they make that look easy. I think for them it actually might have been easy, at least across those first several albums. Ingmar Bergman's announced final film—he would actually make many more movies for Swedish television, including Saraband in 2003—is a colossal formal banquet of a movie, with many courses and a fine table. 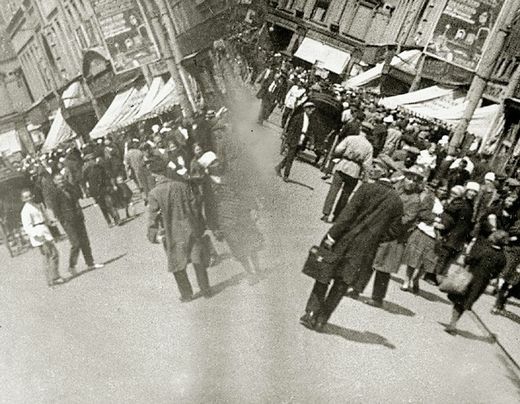 The long version (the one to see) rambles at its ease between the church, streets, theater, and homes of Uppsala, a small but growing Swedish city in 1907. Across winter and summer holidays, Bergman's deeply complex stories and film penetrate the tormented and banal lives it observes easily and naturally. Riffing on the profile of a bourgeois extended northern European family, much in the vein of Thomas Mann's Buddenbrooks for an earlier era, it is plainly the work of a master, a clinic in how to turn many sharply observed small elements into a fine movie. Interestingly, it's not even the first time Bergman released a very good long picture theatrically, with a far superior and even longer version in the wings just behind it (in the U.S., at any rate). The first was Scenes From a Marriage, from 1973, which I think is even better than Fanny and Alexander. 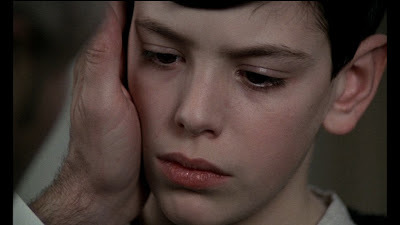 But Fanny and Alexander is the one that gets pride of place in surveys such as the big list at They Shoot Pictures, Don't They?, where it presently sits at #57 (compared with #360 for Scenes). I suspect this is because Fanny and Alexander is more overtly and even self-consciously literary in its ambitions, applying itself equally to sumptuous Christmas celebrations, familiar rotting church-inflected corruptions of the soul, and plain old ghost stories, Henry James style. Potential spoilers ahead. 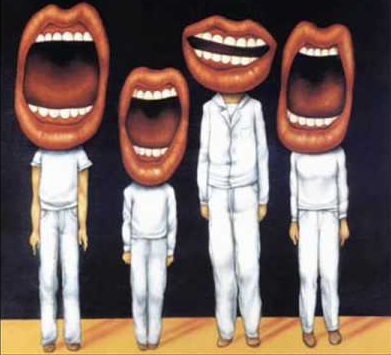 More trials and tribulations of the contrarian: As often the case with me when favorite artists find success, I had a number of misgivings about the fourth album by Talking Heads, Remain in Light, arguably their breakthrough project artistically and maybe even commercially too. Certainly it delivered them to a wider audience, building on the hunger for wide-ranging source material that always drove the band and producer/collaborator Brian Eno, and certainly "Once in a Lifetime," "Houses in Motion," and "Born Under Punches" have become significant signature songs in the many years since, and yes, I've more or less embraced all that entirely. But the quiet and evocative "Listening Wind," which seems closer to Eno's Another Green World, remains the song on the album that never fails to win me over when it plays, a quiet insinuating thing of canny textures and effortless execution, moving along like a well-oiled buggy. The vocal line is chanting and rhythmic, opening up to a gorgeous moan on the chorus that is a pleasure to sing or roll one's head about with, and the instrumental is rich with grain and feel and the sweet touch of an undercurrent of urgency. It's way less complicated than the other songs on the album, almost a lullaby in effect, with numerous small pleasures that tell, never making a particularly big deal about it. I guess I thought the rest of the album was a kind of exercise in braggadocio—"Look at what we can do now," it demands by implication—whereas "Listening Wind" feels much closer to having absorbed something essential, now reflecting it back with preternatural poise. Oh yeah "big" is the right word here, might as well put it in the title, because it is just that in so many ways: long, dense, rewards playing loud. 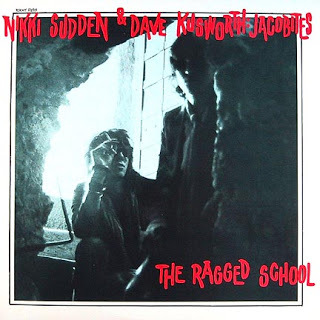 The Jacobites—'80s Brits Dave Kusworth, Nikki Sudden, and Nikki's brother Epic Soundtracks—indulged various favorite influences with this project, most notably Stones, Dolls, Faces, and Crazy Horse. It was a little bit of a surprise, as the work before that of Sudden and Soundtracks, in Swell Maps, hewed closer to soundscape elaborations, moody noise exercises that dared tedium and never tried hard to resemble songs. But if the Jacobites represent some kind of commercial feint, or simply a gesture toward a kind of mainstream, well, no problem there. No problems at all as a matter of fact. Sometimes I'm pretty sure the Jacobites was the best band anywhere in 1984 and 1985 and I know that's a tall statement with such as the Mekons and Jesus and Mary Chain gearing it up (not to mention the Replacements, Bruce Springsteen, Prince, and God knows what else you can name from the period). But that's the kind of place one's head is apt to go under the influence of such things as "Big Store," which lasts eight minutes. It blunders in like an elephant, with all the wisdom and dignity as well as imposing size of the beast. Nikki Sudden's vocals are slow and drawling, ambling roaming and feeling the way. The song surges and pounds like ocean waves. It is mysterious and gray like fog. The guitar plucks out ragged notes like pearls on a string. It puts one in a dreamy, analogizing frame of mind even as it eases one's weary wary mind. Black Mirror (s1-2, 2011/2013)—Some great stuff across all six of the stand-alone episodes of this BBC series, really short films each in its own right, spanning two seasons already. Some (such as "The National Anthem," the first) work just because everyone seems so into it, however preposterous, the game face stays on. More often they pile on with ingenious near-future thought experiments about our burgeoning cyborg culture, with great writing and performances, and only one stinker in the bunch. Bringing Up Baby (1938)—As Cary Grant/Katharine Hepburn vehicles from 1938 go, I prefer Holiday. But this is perfectly splendid as well, although true confession it did not take the first time I saw it, which I'm sorry to say was not that long ago. The principals are both hilarious, and the wild cat prowling around works too. Have a feeling this one just gets better. Catfish (2010)—At the center of this documentary is a sad, disturbing, and very interesting woman. But these filmmakers don't know what to do except point at her. This could have been much better. Charlie Wilson's War (2007)—A little too pleased with itself, but what do you expect from Mike Nichols, Aaron Sorkin, Tom Hanks, etc., etc. It's talent landmine, prestige production, and you-can-look-it-up historical. But is it as good as Argo? Almost!